This is the second book in Sharon Penman’s Justin de Quincy mystery series set in medieval England. 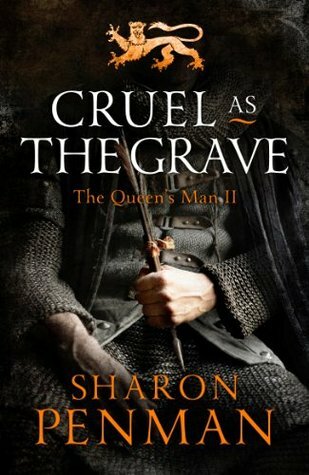 I liked but didn’t love the first one, The Queen’s Man, which is why it has taken me a while to get round to continuing, but I’m pleased to report that I found Cruel as the Grave a stronger and more enjoyable book. You could start with this one if you wanted to – there are some recurring characters but it works perfectly well as a standalone mystery. In this book, set in 1193, Justin de Quincy, illegitimate son of the Bishop of Chester, is investigating the murder of Melangell, a young Welsh girl found dead in a London churchyard. The main suspects are the two sons of a wealthy merchant – the handsome, favoured eldest son, Geoffrey Aston, and his bitter, envious, younger brother Daniel. The Aston family are expecting Justin to clear the boys’ names, but as he delves deeper into the circumstances surrounding Melangell’s death, he is not sure he will be able to do that. The more he learns about the girl, a poor pedlar’s daughter, the more he begins to feel an affinity with her and he becomes determined to bring her killer to justice no matter what. Meanwhile, two other brothers are also causing problems for Justin. The King of England, Richard I – the Lionheart – has been captured by the Duke of Austria and handed over as a prisoner to the Holy Roman Emperor. His mother, Eleanor of Aquitaine, is looking for a way to free him from captivity. In Richard’s absence, his younger brother John is plotting to take the crown for himself and has seized control of Windsor Castle. As Justin has assisted Eleanor in the past, she turns to him again for help. Justin’s two missions are quite separate – one having implications for the whole country and the other much more intimate, affecting only a small number of people – but there are some parallels, such as the relationship between Geoffrey and Daniel resembling the one between Richard and John. The two storylines alternate throughout the book, but plenty of time is devoted to each one and I found them both interesting. As a murder mystery it is more tightly plotted than the first book in the series and although the culprit turned out to be the person I had suspected almost from the beginning, I still enjoyed watching the truth unfold. Unlike Durand, John was not hostile. He seemed curious, almost friendly, as if welcoming a distraction midst the monotony of the siege. The Prince of Darkness. Justin wondered suddenly if John knew about Claudine’s private jest. He suspected that John would have been flattered, not offended. He must not let down his guard with this man. John could as easily doom him with a smile as with a curse. I’ll think about reading the other two books in the series next time I’m in the mood for a medieval murder mystery, but first I really need to read The Reckoning, the final book in her Welsh Princes Trilogy, which I’ve had on my shelf since finishing the previous one, Falls the Shadow! I am counting this book towards the R.I.P XIII Challenge (category: mystery). I only know Penman through The Sunne in Splendour and hadn’t realised that she wrote mystery novels as well. Is this a recent publication? She’s certainly not as well known for her mysteries as she is for her big historical novels. This book was published in 1998 but the last in the series was published in 2005, so maybe she has given up on the mysteries for now. I was underwhelmed by the first book so I never picked this one up. I’m glad that it is a progression, I might well pick it up if I see it in the library, but I really should catch up with Sharon Penman’s ‘big books’ first. I definitely think this was an improvement on the first Justin de Quincy mystery. It doesn’t compare with her ‘big books’ though – and I have plenty of those to catch up with too. I’ve only read Sunne in Splendour and really should read some more of Penman’s work. I was nearly put off reading it due to its size but I absolutely loved it, so why I find it so hard to pick up any more of her books I don’t know. Maybe I should read one of these shorter books to give me another taste. Which of her other, non-mystery, books do you recommend? I loved The Sunne in Splendour too, despite the size. I haven’t read many of her other books yet myself, but I can highly recommend Here Be Dragons which is about King John’s daughter Joanna and her husband, Llewelyn the Great. I read Penman years ago and didn’t really like her. My tastes have changes, so I guess I should try her again. What would you recommend? I haven’t read many of her books yet, but I enjoyed the first two books in her Welsh Princes trilogy, Here Be Dragons and Falls the Shadow. I have the third one ready to read soon. Maybe I’ll try those. I’m interested in Wales. Is it Pendragons? They are set later than the Pendragons – the first one is about Llewelyn the Great in the 13th century. Oh, interesting. I know nothing about Welsh history. This one sounds like an entertaining mystery. I haven’t heard of this author before. Looking forward to your reading and reviewing of the Welsh Princes trilogy conclusion, as well as the other entries in this Justin de Quincy saga. I loved the first two Welsh Princes books, so I don’t know why it is taking me so long to get round to the third one. I’m hoping to read it before the end of the year. I wish I had two parallel lives running so I could read all the historical fiction you blog about as well as keep up with my own reading projects! I love stories that include Richard, Lionheart and Eleanor of Aquitaine, so since this is set in Medieval times I will add it to my sooner rather than later list! I did not know that Sharon Penman wrote mainly about that era. Interesting! Two parallel lives would be very useful for people who have TBRs like ours! As well as these mysteries, Penman has also written a whole series of her big historical novels about Eleanor of Aquitaine and her sons – the first one is “When Christ and His Saints Slept”. I haven’t read them yet, but probably will once I’ve finished the mystery series and the Welsh Princes series. I finally finished When Christ and His Saints Slept this month (after starting and stopping the book multiple times since 2013). I don’t know why it took me so long, since I absolutely loved every minute of it, but it was a long book that for some reason felt really, really long. Not in a boring way, but in a dense way. Like eating a really rich chocolate cake where one bite leaves you stuffed even though you want to devour the whole cake. I guess SKP is an author I need to savor. I have her Welsh series on my shelves along with the rest of her Henry & Eleanor books and her Richard III book (your positive comments about this latter book inspire me despite its massive page count). Maybe in another five years I’ll make it through another one! I’m curious about her mysteries, but I’m more drawn to her straight historical novels. I know what you mean about Penman’s books feeling very long but in a good way – I had the same experience with her first two Welsh Princes books and The Sunne in Splendour (all of which are wonderful but very intense). The mysteries are much shorter and don’t really compare, but they’re still enjoyable reads. I haven’t read When Christ and His Saints Slept yet, but I’m planning to start that series as soon as I finish the Welsh trilogy. I’m glad you loved it!